Remember picking up a stone or pebble because there was just something about it? Well, here’s a whole quarry of quirky, engaging, happy, sad, afraid, shy, joyful and just plain outrageous ‘stone’ characters, specially created for building a feelings vocabulary! Describing feelings is at the heart of emotional literacy and therapeutic work. Yet, sometimes people interpret feelings very differently. Each card in this set features a stone on one side, and three words on the reverse to describe the emotion shown. Hey, that stone seems to be quivering: is he embarrassed, humiliated or shy? What about that heavy stone rubbing his chin: is he thoughtful, curious or concerned? 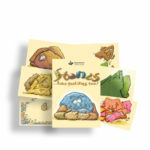 The 52 Stones cards are perfect for all sorts of activities. If you’re a therapist, you might choose these cards to open a conversation with a client about a difficult problem. Which card represents the client’s feelings when the problem is worst? Which card represents the time when the problem is gone or more managable? Don’t forget you can purchase the Stones as cards and there’s also the Stones Value Pack. 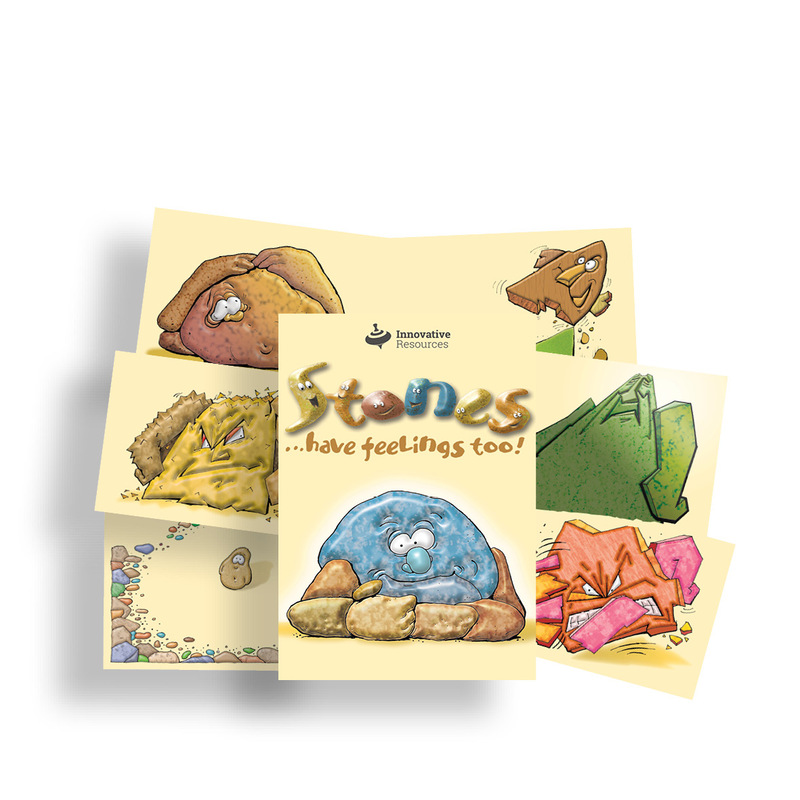 It includes The Stones cards, the companion sticker sheets, the picture book The Wrong Stone, and our Pocket of Stones, containing 12 handcrafted, ceramic ‘stone’ characters—perfect for tactile learners. To purchase this product (operating through Campion My Connect) click on the Campion Bookshop button (at the top of this page under the price). This will take you to the Campion bookshop. After purchase, download the Campion App and The Stones will appear in your library. Here is some more information to guide you. Digital Version published by Innovative Resources, 2017. ‘Recently I discovered that the Stones…have feelings too! cards are an excellent resource in supervision with staff. They were really useful in helping a worker to articulate how she was feeling about her planning, goal setting and current work with a family. She then selected the stones she wanted to relate to and the feelings associated with these cards. This opened up a new conversation about the worker’s current strengths and ways that she can use them to enable a shift towards the ‘preferred stones’. This flowed on to what the worker decided she could do to enable this to occur and new plans for the family intervention and her overall practice. It was a real ‘ping’ moment! Susan LaFever is an elementary school counselor at Norwich City School District in central New York, where she works with students from Pre-K to 2nd Grade. In the past few years Susan has purchased a number of Innovative Resources’ card sets at her own expense— ‘because they are awesome!’—and, boy, does she use them in some fabulously creative ways! So how does Susan use her cards? With sophisticated simplicity! ‘Each year I use one of the card packets as my “theme” and design at least one opening activity to accompany the cards.’ That opening activity is used with students and their caregivers when they meet the school counselor for the first time. In 2013, she picked Stones … have feelings too! and developed an activity for children in changing families. ‘Students used the Stones stickers to create family portraits illustrating their homes,’ including their multiple homes in the case of children staying at different family residences. Susan encouraged the students to use the Stones cards to share their feelings in a safe and caring way. ‘After a few sessions, students know to come right into my room and point to the card showing how they are feeling, then describe what is going on [in relation] to the feeling they choose’. With her added interest in Sand Play Therapy, Susan quickly spotted that the stones also ‘lend themselves naturally to creating “zen” type sand trays,’ which she used as a closing activity. This year, the Cars ‘R’ Us cards have been colourfully displayed in Susan’s office (‘my roads started on the wall!’) and she has also been using The Bears. Students made feelings books using The Bears as their starting point, while other activities have been developed using Strength Cards for Kids. During September, our collection of ‘stony’ resources inspired lots of fun and creativity at the Women’s and Children’s Hospital in Adelaide. Art therapist, Belinda Ryan, selected our picture book, The Wrong Stone, as her starting point for some ingenious workshop activities for siblings of children in the hospital’s Paediatric Palliative Care Unit. Children identify with the stony characters immediately, and there are so many ways you can play with stones! Siblings of children who have a life-limiting illness can often feel isolated and alone. 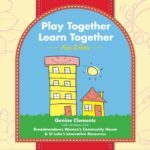 So we developed a pilot program for 8-12 year olds to help them connect with one another, have some fun and feel special. The Wrong Stone was the perfect story to use for a series of art-based activities. Children identify with the stony characters immediately, and there are so many ways you can play with stones! After reading the picture book, each child chose their own special stone to carry with them. Then the stones were used to frame a beautiful mandala created from colourful sand and pebbles. At the end of the two-day workshop, children collected some of the mandala to take home with them. They also painted a symbol on their ‘perfect stone’ as a reminder of their own gifts and special place in the world. For another activity, we created a spectacular stone wall (based on the one in the book) and used it as a setting for a puppet show. The children used the puppets to express what it’s like to have a brother or sister who has (or had) a life-limiting illness. Surrounded by all the stones celebrating difference and uniqueness, the puppets were able to ‘speak’ freely from their places along wall. Innovative Resources’ Stones …have feelings too! and Pocket of Stones provided us with a brilliant barometer of how the children were feeling over the two days. Each child was also presented with a copy of The Wrong Stone and some of the Stones…have feelings too! stickers. The book presentation was a real highlight of the workshop, and we followed it by re-reading the story together (with gusto!) to reiterate its messages. It was satisfying to give the children these permanent mementos, to remind them of their special place in the world and all that they learned during the program. Thank you to Russell for his clever, insightful story and for the other stony resources. I have used The Wrong Stone with various client groups because it communicates an important message and is easily accessible to readers. The stones theme worked tremendously well and had a real impact on the children. They won’t forget that they all have unique qualities, and there is a perfect ‘spot’ for each of them, no matter what else goes on in their lives. Women’s and Children’s Hospital, Adelaide. A Review of Stones …have feelings too! Stones …have feelings too! is a deck of fifty-two colourful laminated cards. Each card features a stone cartoon character representing an emotion. On the reverse side of each card are three suggested emotions the stone might depict. There are no words on the front of the card, so the user can interpret the picture freely. Stones comes with a booklet of suggested uses, which encourages flexible and creative thinking rather than prescriptive use. The cards can be used to explore individual feelings, mapping of family feelings, family ‘sculpture’ work, or to explore group developmental stages. The cards can be used selectively. Initially, we had some concern that many of the illustrations seem obscure. Part of the problem is that the facial expressions, postures, gestures, and setting of the stones are sometimes ambiguous. But the ambiguity of the cards turned out to be useful, because the children could use them to describe idiosyncratic or ambivalent feelings. It also helps the counsellor avoid assumptions and prescriptions. Children may describe many cards as ‘happy’ or ‘sad’ because they focus on the perceptible smile or frown on the stone. Also, some symbolic thinking is required to understand, for example, that a stone with a hole in it suggests feeling ‘hollow’, ‘empty’, or ‘drained’. However, in our individual work with children, we found they readily made their own interpretation of the cards. They enjoyed the activity and described the cards as: ‘cute’, ‘fun’, ‘a funny puzzle’, ‘hard [to work out] but fun’, ‘really cool’, and ‘something different’. We used the cards to good effect in a domestic violence group for children 7–11 years of age. Each child was asked to choose a card that represented their feelings about the group closing, and then to describe their feelings. The cards suited the various personalities in the group, and the children freely expressed what they saw in the cards and were not distracted by the words on the back. Stones may be more appealing to men and boys because they are not as ‘cute’ as The Bear cards. They might also be better suited to upper primary children, adolescents, and adults; clients who have a reasonable vocabulary of feelings and some abstract thinking ability. St Luke’s have taken the concept a step further by producing a set of stone figures. A Pocket of Stones is a set of twelve hand-crafted, ceramic heads, each one with a different shape and a different facial expression. This adds a three-dimensional tactile element that would appeal to children and adults alike.